When Are Open Streets Events Really Open Streets Events? Tomorrow, Saturday, April 23, the city of Burbank hosts CiclaBurbank, billed as “a local Open-Streets event on the Burbank On Parade route while it’s still closed to motorized traffic.” The event takes place from 8:30 to 10 a.m. on Olive Avenue between Victory Boulevard and Keystone Street. 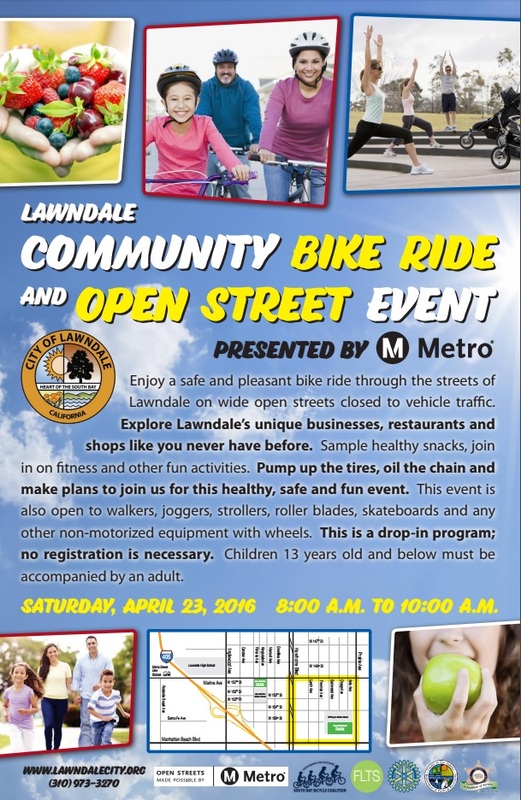 Also tomorrow, Saturday, April 23, [corrected] the city of Lawndale hosts its Lawndale Community Bike Ride and Open Street Event. The event takes place from 8 to 10 a.m. on a 2-mile long square route bounded by Hawthorne Boulevard, Marine Avenue, Prairie Avenue, and Manhattan Beach Boulevard. Details on flier [PDF]. I am a big fan of open streets events. I helped start L.A.’s CicLAvia. I’ve been to lots of CicLAvias, and Beach Streets. I have planned Bay Area vacations to coincide with Sunday Streets. When I was nearby, I made sure to experience New York City’s Summer Streets. I think that CicLAvia and ciclovías have been transformative for greater Los Angeles. For participants, they are liberating. For cyclists, it shows us the breadth of humanity who really want to bike. For pedestrians, it shows how welcoming car-free spaces are. For families, they are safe fun places to explore cities. For new or very infrequent riders, it shows that it is much easier than you expect to bike farther than you think you can (in less time than you thought.) Even for people who just see the photos of the event, it helps to re-imagine what a street can be. As a cyclist I am used to scaled-back expectations. I am used to taking the crumbs of leftover space after drivers have consumed all they can. But I confess that I am kind of skeptical of this weekend’s open streets events. How many hours long does an open streets event need to be? I do not recall having done one that lasted fewer than five to six hours. So, if an event lasts 90 minutes or two hours, is it really open streets? If I don’t have time to take a break, talk to friends, get a snack, then it isn’t really open. If it takes me longer to get to the event than the event lasts, then I won’t show. I’m going to get quantitative and assert that four hours is about the minimum duration for an open streets event worth the name. How far do open streets have to extend? None of the U.S. open streets events can hold a candle to Bogota’s Ciclovía, which opens 80 miles of streets every Sunday. But at least a couple miles is very worthwhile. I did a three-mile Sunday Streets route in the Mission in San Francisco one year, and it was great. To me, Lawndale’s two miles sounds right around the bare minimum, but Burbank’s one mile sounds inadequate. Should, in Lawndale’s case, Metro be investing limited open streets funding in 2-hour-long 2-mile long events? In my opinion, probably not – or Metro should at least gear its funding criteria to favor full-fledged events. In the case of Burbank, there is an opportunistic element to the event. There is no Metro funding. The organizers are taking advantage of already-closed streets for a later parade. It is a bit similar to Long Beach’s pre-Grand Prix open streets, even though they pale in comparison to full-on Beach Streets. Burbank’s doesn’t quite feel open if there is a need for pre-registration and arm-bands, and a limit of 250 participants. But… should we be calling these mini-events “open streets”? Can we call them something else? Half-open streets? Ajar streets? Ciclovía-itas? Mini-streets? My unsolicited closing advice to wise people in Burbank and Lawndale (I am not in your shoes, so I don’t know what you were attempting to do and what sorts of compromises you may have endured): Enjoy this weekend’s events. But please keep pushing for a real full-on open streets event. It will be transformative. Readers – what do you think? How long and how far should be the minimum for an open streets event? What would you call these mini-ciclovías? I agree. I briefly got excited about Burbank until I learned about the details and decided it wasn’t worthwhile between the short duration and the pre-registration requirement. As you said, I don’t think the community or attendees will see the true benefits of these types of events on such a small, limited and short scale. Is someone really going to be regulating people coming in or leaving the entire mile route? If someone lives in the neighborhoods and wants to walk to a shop on the route, are they going to be turned away if they didn’t pre-register? If so, that seems counter productive to the event! Part of these things are about the people in the neighborhood wandering outside and wondering what’s going on and realizing it’s a benefit to their lives, not making the event into something that stops them from even visiting the businesses on the route. As it is, I almost felt like the Pasadena CicLAvia was pushing it with only 3 miles and a very bizarrely laid out route (which I think actually seemed pretty bad for the businesses further south on Lake because so many people kinda got trapped on Colorado or in Old Town and the Lake leg didn’t really go that far. It’s also weird considering that Pasadena is no stranger to closing off miles of roads for events.) I also know that the Chandler bike path in Burbank is pretty popular, so there is a desire and need for safe space to bike and walk. For Burbank, I just did some calculations. It’s limited to 250 people – in a mile of street (5280 feet) – that would mean that people would be just over 20 feet apart if stretched single file (and it won’t be single file – on a car-free car-scale street.) That’s a disappointingly low number of participants… so much less than a street can hold. The rich thing about CicLAvia is that it fills the streets. Those 250 people won’t experience this. How many Lawndale businesses will be open at 8 am? The Lawndale one seems really silly. I understand if businesses need to get their normal clients in the afternoon, but stretching it to noon, with an hour for pickup, or taking out two of the streets to form an “L” until 4 or 5 pm to not landlock anyone seems more reasonable. The first Sunday Streets in San Francisco was on an early Sunday morning–okay, it was at least four hours long–and it was in a largely industrial area that the city decided would be least impacted by closing streets to traffic. There was such a fight to get it happening at all that the organizers took what they could get. And look where they are now! Not quite every Sunday, but pretty good. “Ajar streets” is hilarious and maybe appropriate: once you get your foot (or bike) in the door, it’s harder to close. On point, Joe, as usual. IMHO anything that requires registration isn’t an open streets event. The Lawndale event was Metro funded ($40,536 for 2.2 miles). Hard to imagine how that event received competitive funding when so many others that would have produced actual open streets events did not, unless they totally changed the event and Metro staff didn’t push back. I heard the Lawndale event was before a city parade, so were they really just using Metro funding to off-set their normal parade costs? Something isn’t adding up. Pasadena did one of these “mini-open streets events” the year they had the downtown finish of the Tour of CA. Kaiser Permanente gave them some funding to keep the street closure for the race going longer, and they gave the public 2 hours or so of time to ride empty streets before the race. The only problem was they specifically did not market it so hardly anyone showed up, and we heard the Old Pas merchants hated it since they lost business that morning. Needless to say no more downtown ATOC finishes. Sounds like “open streets” is one of those “elastic” terms like “bus rapid transit”. I’m no expert on such matters, but there’s nothing “open” about an event that requires pre-registration. Just my 2c here. The distance isn’t that important, its what it covers. My town has an open streets events where we close main street a few times in the summer. Only 1 km or so are ever closed, which is well under a mile, however, given that this isn’t a large town, its effectively closing most of downtown. For me, the coverage of this key business area is more important than mileage. I constantly hear excuses why these events need to be limited in scope, but to me these are exactly that – excuses. Bogota manages to have 80 km of open streets every weekend. There is no reason that LA can’t match or exceed that. While I agree that these events are very small and not in the style of a full ciclavia, do you not see the worth in this model if it becomes a standard. I.e. a 2 hour reservation of open streets every time there is a later parade/race/etc/ that closes the streets to cars anyway. Imagine that for people who live in these areas, they may get a short amount of time, but at least it’s close to where they live. Lots going on this week including South L.A. community plan hearings, a Metro board meeting, pop-up street festivals, autonomous vehicles, high-speed rail meetings, and more!